Want a custom Video Wall? LG’s got it. Now imagine it before you buy it. A question I get asked all the time is quite simply, “What the heck is a video wall?” I’m right there with you. Before I started working for LG, I was clueless as well on the product let alone its usage. But then, something beautiful happened. I learnt what a video wall is and I started to notice them out in the wild. As I walked through an airport, checked into a hotel or attended a game; they were all there displaying rich content with astonishing clarity. You probably guessed it; they were built by LG. A video wall is essentially a series of video screens in several different formations and configurations that are powered together to display rich content seamlessly. Visually stunning, they are meant to be attention grabbers and drive focused eyeballs. If the average attention span of a human is eight seconds, then brands use video walls to grab all eight seconds of your time to push forth content and messaging to elicit responses. You need technology from the frontend screens to the backend software to power these messages and LG’s video wall arsenal is quite formidable. Video wall configurations are usually always custom and specific to a customer’s space constraints and needs. This requires careful evaluation with accurate measurements before an order is actually placed. It’s hard for LG sales to travel with screens this size to customer meetings to close deals and therein, results in a huge gap between preorder visualization and actual install. Then we launched the Video Wall Configurator. 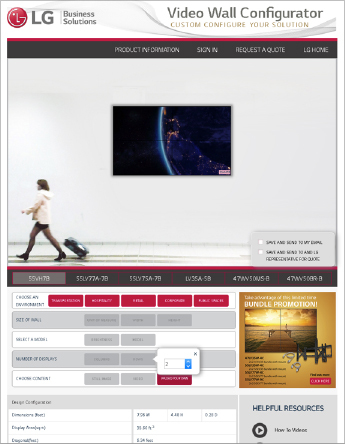 Simply put, our video wall configurator is an online tool designed to aid sales and customers in “visualizing” their custom configurations and saving them for future use. Visualize custom video wall configurations in standard environments or upload your own. Map a chosen configuration accurately with measurements and save it as a blueprint. Email the blueprint to yourself or directly to your LG sales rep to begin conversations. 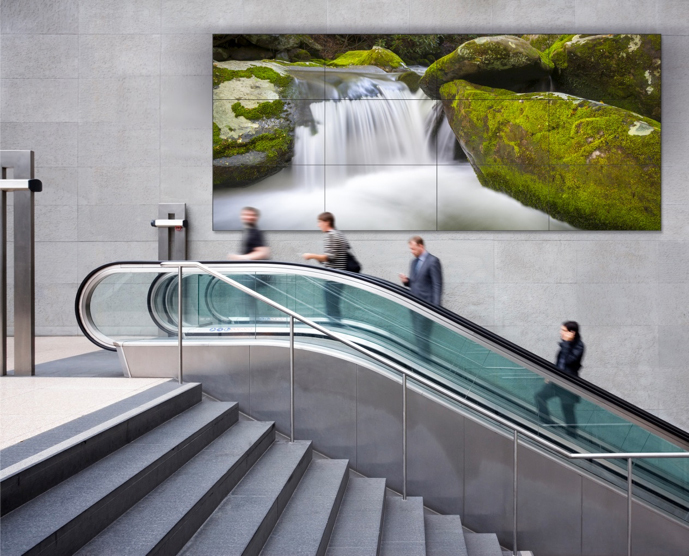 Visualize content on your video wall, be it hi-res images or video. Watch How-To videos to install them. This is a great example of how a strong digital tool can aid and sometimes accelerate the sales process.We are excited to launch this at LG and be the best of breed in winning customers with confidence and integrity. Onward.